pine trauma occurs when the forces applied to structures of the spinal column overwhelm the mechanical stability of those structures. Typically, this happens during high speed accidents, falls, or sports. However, even lesser forces can cause spine trauma if the spine is already weak or vulnerable because of pre-existing arthritis, degeneration, or bone loss. Spine trauma can cause pain arising from damaged bones and joints. More seriously, trauma can disrupt the normal alignment of the vertebral column, causing pressure on the spinal cord or nerves. The result can be pain radiating to an arm or leg (radiculopathy), weakness, spinal cord injury or even paralysis. 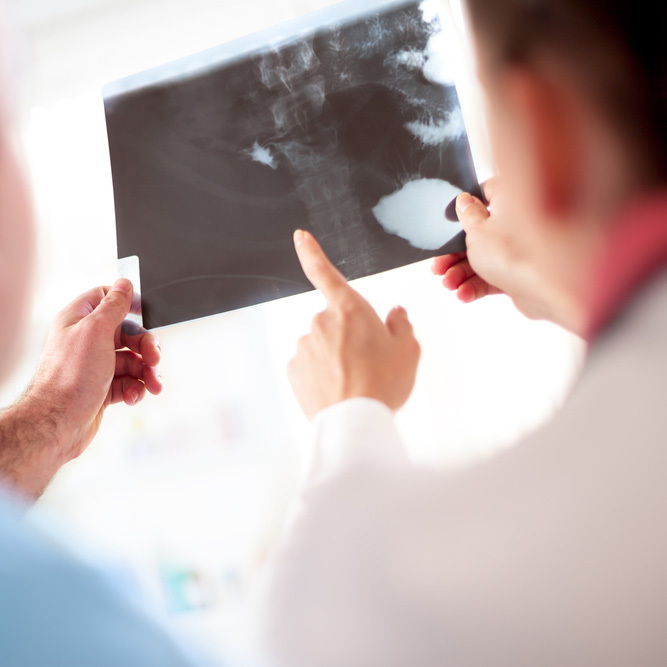 It is important to seek medical treatment immediately after experiencing spine trauma. Certain neck pain or back pain, if not treated soon, can become permanent. With over 70 years of combined spine trauma experience, the specialists at North Jersey Spine Group provide expert, cutting edge evaluation and treatment for patients with traumatic injuries to their spinal columns. Our brain neurosurgeons who are also spine surgeons, provide emergency management of spine trauma at hospitals across northern New Jersey. For elective treatment, patients can receive quality and compassionate care from our board-certified specialists, including spine neurosurgeons, physiatrists, and physical therapists. Working collaboratively, our team evaluates and treats injuries in the spinal column, spinal cord, and spinal nerves. Patients who live in Bergen County, Passaic County, Essex County, Morris County, and Hudson County including towns such as Paramus, Montclair and Morristown NJ, have access to the leading experts at North Jersey Spine Group. It is important to seek proper medical treatment immediately following any symptoms that imply nerve damage. North Jersey Spine Group specializes in all areas of neck and back pain care, offering a unique approach when it comes to treatment options. In multiple northern NJ locations, patients receive extensive quality and compassionate care from board-certified spine surgeons, neurosurgeons, physiatrists, pain management physicians, and physical therapists. Working collaboratively the award-winning team evaluates diagnoses and treats traumatic spinal conditions caused by injury to the spinal cord, bones and surrounding nerves. Spanning from Bergen County to Essex County and surrounding towns such as Morris Plains, Livingston and Hackensack, NJ patients have access to the top spine and brain experts at North Jersey Spine Group.